Math Rider . . . TOS Review | My Journeys Through Life . . . Herding Cats In New Mexico! ← “Q” is For . . .
Oh, my twins, “Mr. Loquacious” and “The Puzzler” have REALLY been enjoying “doing math” for the past few weeks! They have been playing a very cool computer game called Math Rider, which we have been reviewing for the Schoolhouse Review Crew. 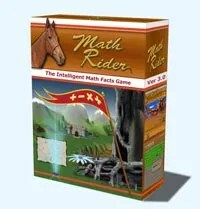 Math Rider is a computer game which drills all four basic operations (addition, subtraction, multiplication and division) while the player goes on various quests, with his or her trusty horse, Shadow. Because it drills the four basic operations, and because it can be set so that the child must begin at the beginning and move on upon mastery, I feel this game would be good for even grade K and up, although the Math Rider FAQ says it’s designed for grade 2 through grade 6. Math Rider can be played on either Windows or MAC . . . complete system requirements are listed here. Math Rider allows up to eight players, each with their own log in, per license. 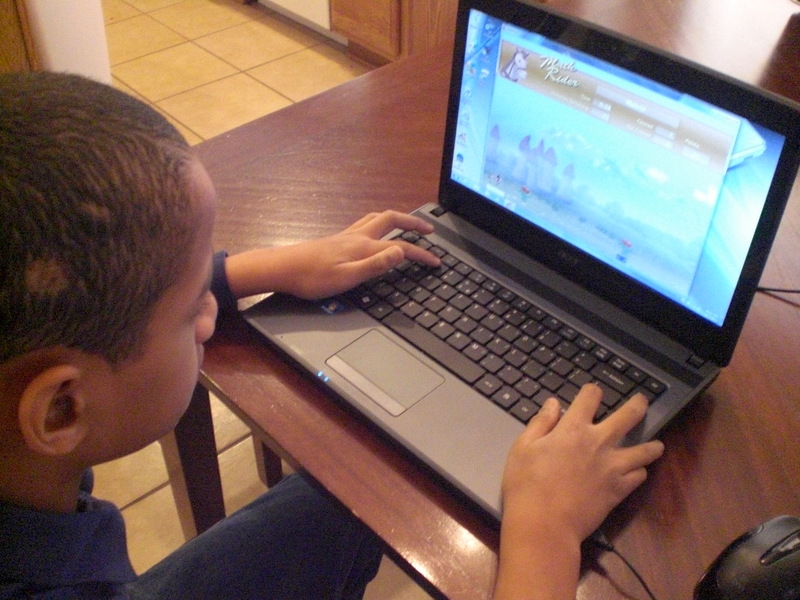 The game is personalized, in that it adjusts for each player, recognizing where the student is having trouble, and working those problems back into play until they are mastered. It “learns” what the rider knows, as well as what he or she still needs work on, so that it then asks the right question for that particular rider. It is not just a random facts generator. Each separate player has his or her every answer stored and analyzed by the software, so each rider’s experience with Math Rider will be his or her own. 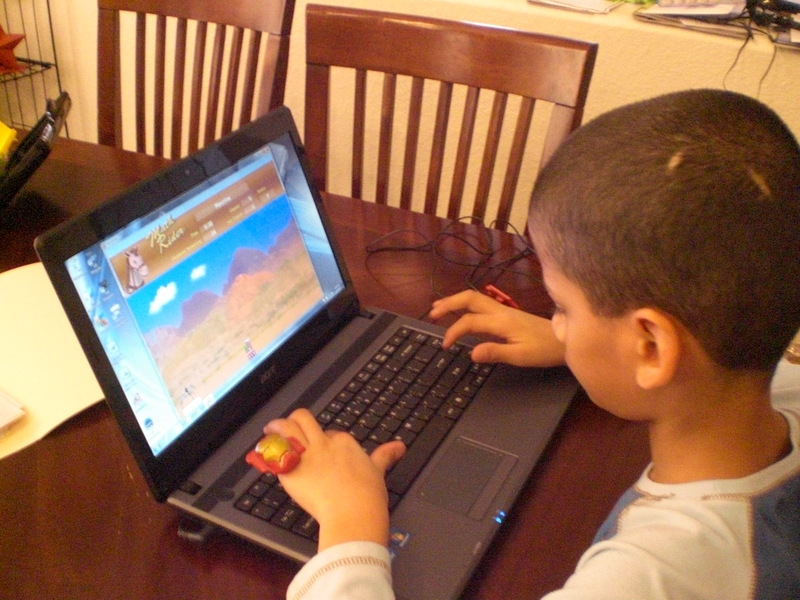 A lot of computer games, even educational games, are (in my opinion) ruined for the child by the difficult controls. You miss aim something, it doesn’t matter if you knew the answer, you don’t get the point or the credit toward a win. In Math Rider, this is not the case. If you can type in the correct number, you win. The creators of this game felt no need to incorporate hand eye coordination as a necessary component into a math game. If the student needs help with a question, he or she can click on it, which will bring up more information, including a visual representation of that question. I do like that. I don’t care for the magical aspects of the game. It does involve a lot of searching for magical flowers, elves, sorcerers and the like. If this is an issue for you, or your children are too young to have any Biblical discernment regarding these things, you may not care for it, but I felt the benefits of the drill in Math Rider gives us an incentive to discuss with our kids why we don’t believe in these things. You can purchase Math Rider for only $47.00, which will give you a 30 day risk free guarantee, plus free updates for life. Here is a video from the Math Rider Website, to show you a little bit about this game in action . . . Here is “Mr. Loquacious” playing Math Rider . . .
And here is “The Puzzler” taking his turn . . . Overall, I do think this is an excellent game for learning the four basic operations, but I also wish there would be a version without all of the magic elements. I know that is not a popular view these days, but it is mine. I will let “Mr. Loquacious” and “The Puzzler” continue with it while we have it, because they ARE learning, but we will continue to discuss the magical elements, and our reasons for not believing in them. To see what other Schoolhouse Review Crew Members thought of Math Rider, please click the graphic below!